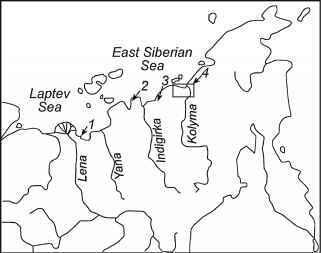 Studies were carried out in the East Arctic sector, from the Lena delta to the lower reaches of the Kolyma in the continuous permafrost zone (Fig. 8.1). The territory is characterized by cold Arctic climate, with a mean annual air temperature of -13.5°C in the west (Tiksi settlement) and -13.4°C in the east (Chersky settlement). The permafrost samples of various age and origin, as well as soils buried in those sediments and burrows of fossil rodents, were selected for protozoological analysis. For comparative analysis, samples of modern tundra soils were taken. The samples of buried soils and burrows were taken on the northern edge of the taiga zone at the eastern border of the Kolyma lowland from the late Pleistocene Ice complex (outcrops Stanchikovsky and Duvanny Yars). The mean annual ground temperature in this region ranges from -5 to -6°C, and the maximal depth of seasonal thawing, which was observed in the summer of 2007 (the warmest summer over the last 25 years), reached 70 cm. The buried soils were represented by peat and a profile of humus-peat gley soil (Gubin 1994); the material of fossil burrows was represented by remnants of herbaceous vegetation in the storage chambers, and included seeds of higher plants, rodent excrement, hairs of large animals, and a mixture of dusty loam. The buried soils and rodent burrows lie at a depth of ~30 m below the surface; their age, according to radiocarbon dating, is 28,000-32,000 years (Gubin et al. 2003a). Frozen samples were taken from the cores of boreholes drilled in the tundra zone of the Laptev Sea coast (Cape Bykovsky), coast of the East Siberian Sea (outfall of the Khroma river, Cape Chukochy) and inner regions of the Kolyma lowland (valleys of the Khomus-Yuryakh, Kuropatochya and Chukochy a rivers). In these regions, the mean annual ground temperature varies from -9°C in depressions to -12°C on watersheds, and the maximal depth of seasonal thawing of loamy soils does not exceed 50 cm. A protozoological study was made of samples from the main horizons of the Pleistocene cross section (Fig. 8.2). 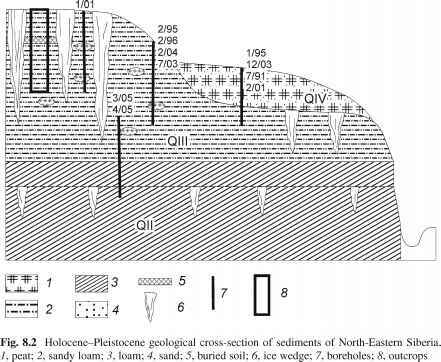 Among them, epicryo-genic sediments of Holocene alases (shallow cryogenic depressions) (boreholes 1/01, 7/03, 2/04 and 2/96) and syngenetically frozen deposits of the late Pleistocene Ice complex (borehole 4/05) turned out be populated with protozoa. The most ancient single findings (borehole 4/05) were attributed to the syncryogenic mid-Pleistocene Ice complex. with all aseptic precautions: the core was handled in a field microbiological box, its surface was trimmed with a sterile scalpel and treated with 95% ethanol, and the sample was placed in a sterile aluminium container or plastic bag and sealed. The sealed samples were stored in a "fridge bore" at a temperature of -10°C. At the end of the season, they were placed in cryothermostates and delivered, in the frozen state, to the laboratory. The samples of buried soils and the material from the burrows of fossil rodents were taken from the frozen outcrop walls. With melting material cleaned out from the wall surface and the unthawed layer exposed, the frozen rock was excavated to make a hollow of 30-40 cm depth, and a sample was taken from this hollow. After treating with 95% ethanol, the sample was placed in a sterile plastic bag and stored frozen. In the laboratory, the samples were stored in freezers at -20°C. (Page 1988) turned out to be the most suitable medium. The cultures were observed in closed, parafilm-sealed Petri dishes using an inverted light microscope. If protozoans were found, the culture was reinoculated. The monocultures and clonal cultures of protozoa were obtained from the enrichment culture by standard techniques; the isolated protozoa were cultivated on liquid and agar media supplemented with various nutrients, such as with bacterial cells of Escherichia coli and Klebsiella aerogenes, or with rice grains (Page 1988; Zhukov 1993). 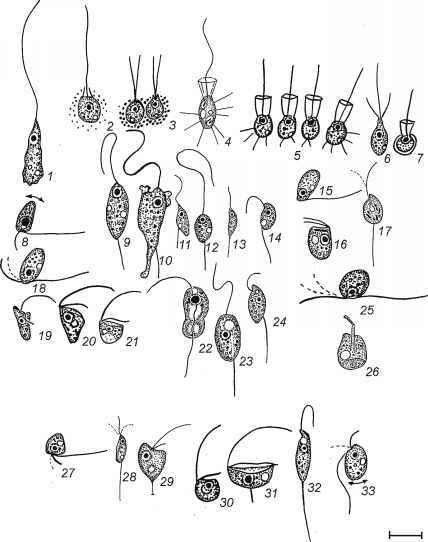 A morphological study of the isolated protozoa was made on either vital or fixed preparations (Pussard and Pons 1977; Page 1988; Foissner 1991a, 1992). The fine structure of protozoa cells in resting (cryptobiotic) stages was examined with a transmission electron microscope.